Doing work in the evenings (after the J-O-B) outside in a neighborhood often requires a certain concern for one's neighbors, especially when saws, hammers and other noisy tools are involved. This is another reason I love handtools, they are quiet. I recently had 6 - 6x6s to cut to size along with some other minor cuts to make for a small outdoor area I am constructing. I made every single one without plugging in a single tool and while still listening to the spring birds singing in the background. I did sweat a little, but that's not really a concern (except for my wife who has to smell me). This big Disston champion-toothed one-man buck saw is a very recent acquisition, I didn't even have time to clean it up properly before I needed put it into use. I just touched up the teeth a little and it glided through this garbage pressure treated wood like a hot knife through butter. Fortunately, this saw hadn't been abused, beyond normal wear and tear and a missing saw nut. It should clean up beautifully and provide many years of productive service. The teeth on these large saws vary in their construction and proper use (based on the tooth style). The champion toothed saw consists of one unset raker tooth, used to clear the saw dust from the kerf, followed by two set cutter teeth (used for...you guessed it, cutting!). This style of tooth is typically used for harder or even frozen woods whereas a lance toothed saw, one raker followed by four cutters, is typically used for softer green or wet wood. 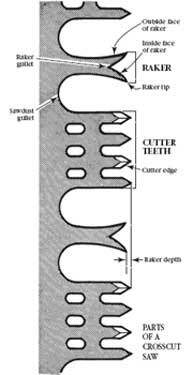 The raker teeth should be just slightly shorter than the cutting teeth as they are filed in a rip fashion. Having the raker teeth just slightly shorter than the cutters helps them clear the kerf rather than cutting the wood (preventing rip filed teeth from tearing fibers in a crosscutting situation). The deep gullets (space between the teeth) on these types of saws allows for the shavings accumulated in a long cut (big log) to be carried to the end of the cut and dumped out the end. The M shaped tooth acts as both the raker (outside edge of the tooth) and cutter (inside edge of the tooth). This design is newer than the champion, plain, and lance toothed saws and is typically reserved for dry hard woods. A full report on filing some of these saws will be included soon in the "Sharpening" page on the blog, keep an eye out for sharp teeth! The small holes, one at the toe and one near the tote, in the saw plate are for mounting a handle. Mounting the handle near the tote helps with gripping the saw through laborious cuts and mounting it near the toe allows a second person to help with this saw, typically used by only one person. I don't own the handle yet, but they go for sale on eBay quite frequently so I'll be on the lookout!